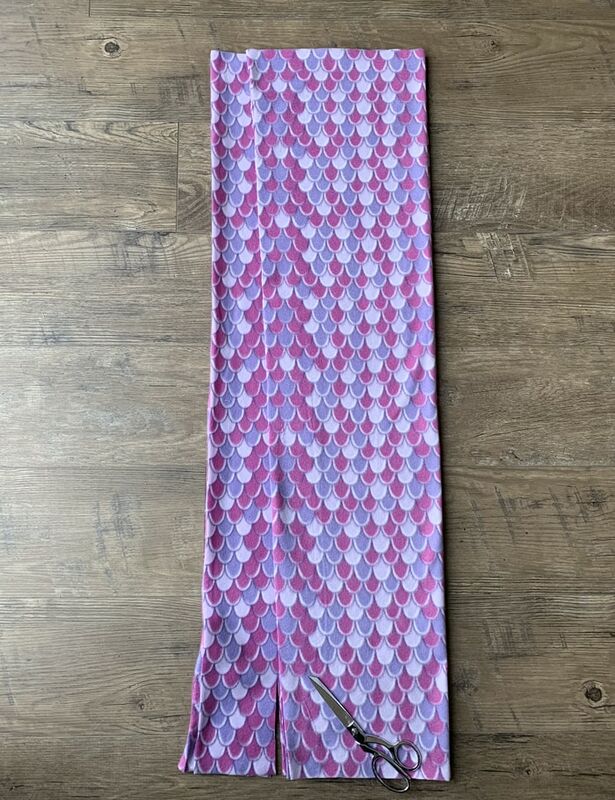 My Leah got a gift card for her birthday and bought herself a mermaid tail blanket. She loves it so much! Unfortunately the fabric it’s made of frayed very easily, so now it’s basically falling apart. I keep trying to sew the thing, but it’s no use. It doesn’t help that she puts her feet in the fin and walks around in it. Haha! 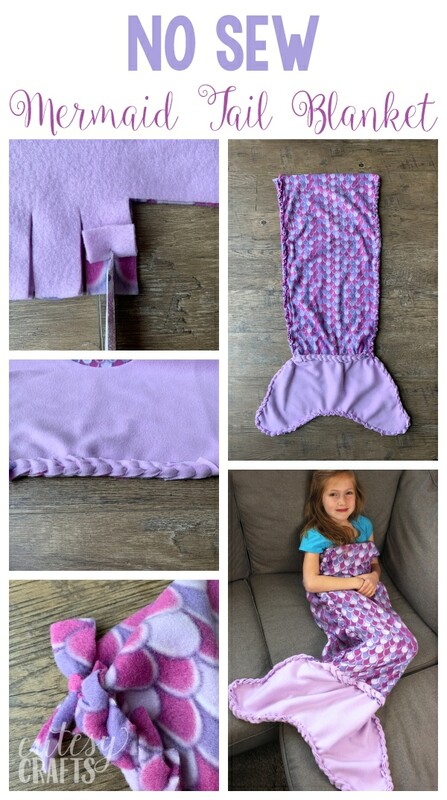 Since she needs a new one, I decided to make a no-sew fleece mermaid tail blanket pattern. 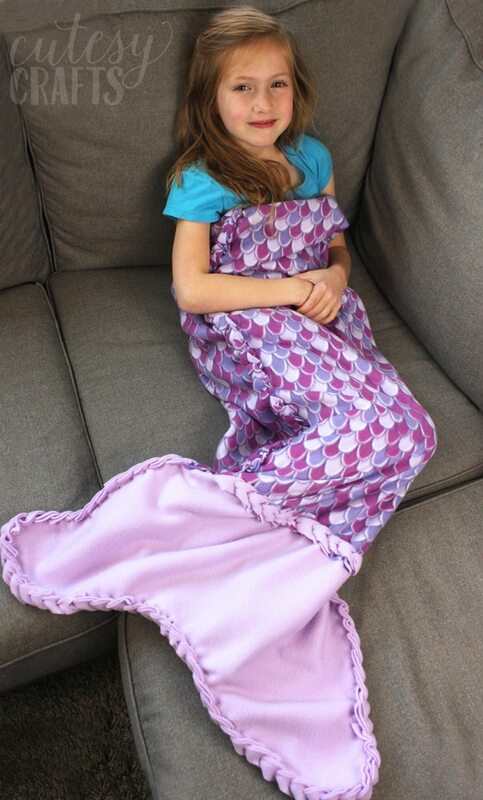 Now you can make a DIY mermaid tail blanket, even if you don’t know how to sew. 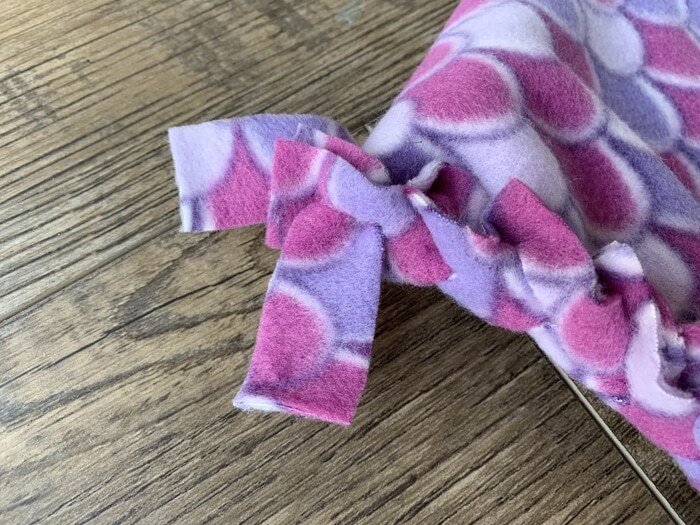 If you’ve never made a blanket like this, take a look at my post on how to make a no-sew fleece blanket with a braided edge. There’s a great video that will show you how to do the braiding part. 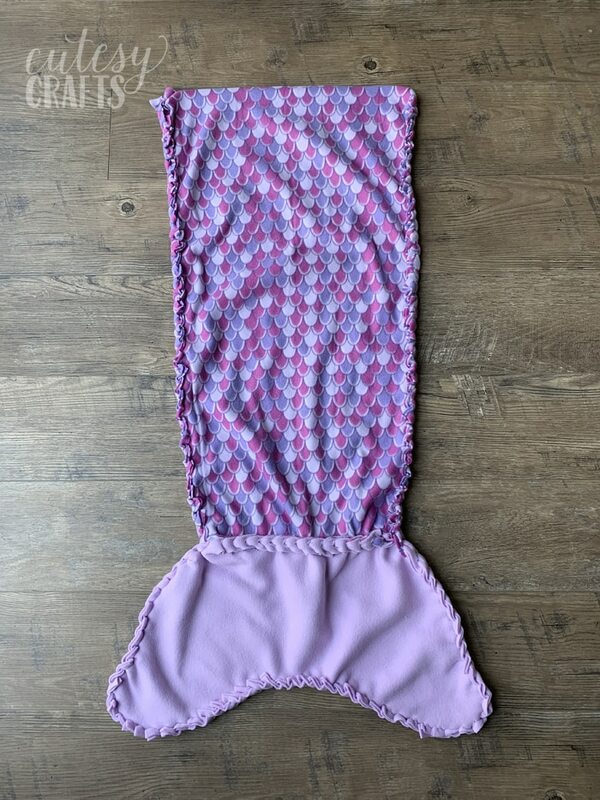 This tutorial is for a child-size mermaid tail blanket, but you can change the length and width of the waist to make it bigger. 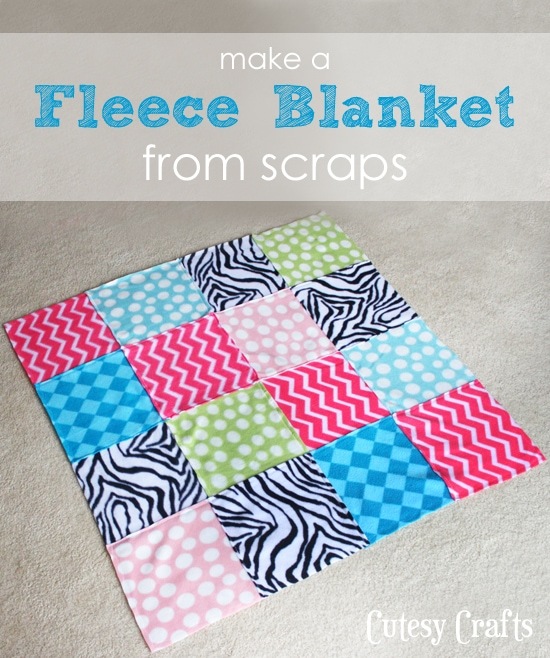 Cut your patterned fleece into two equal pieces that are 42 inches long by about 29 inches wide. 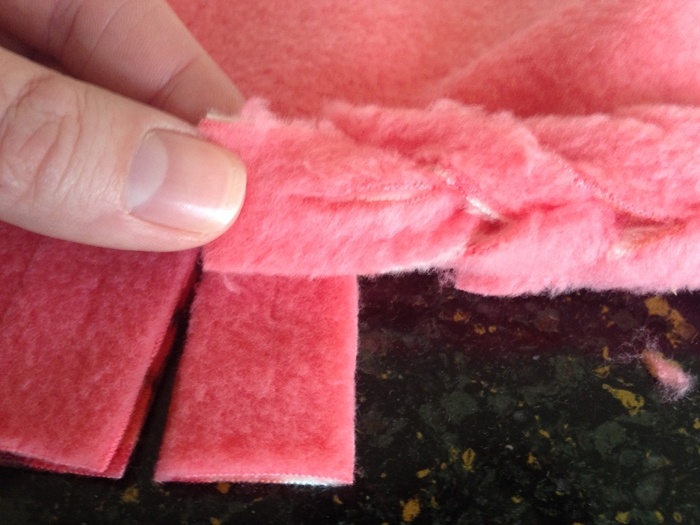 The easiest way is to just cut down the fold that is already in the fabric, from when it was on the bolt. 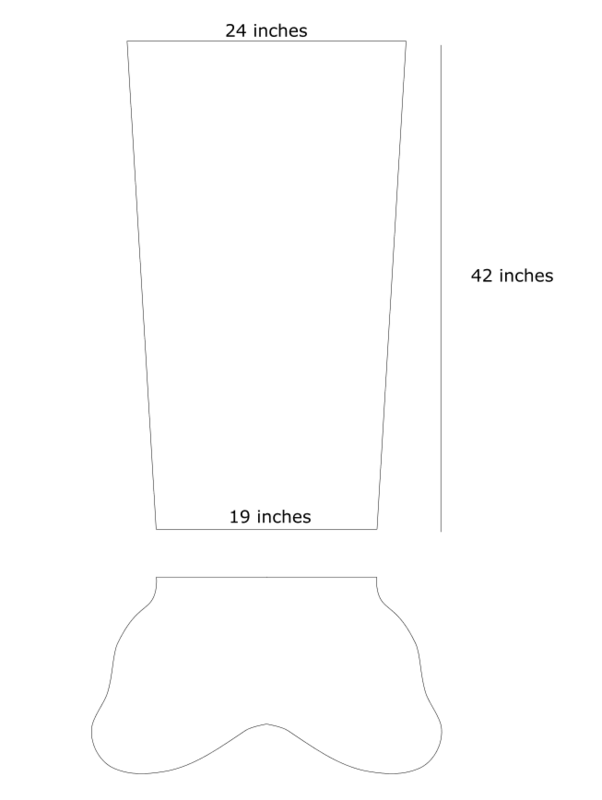 Then you can change the length to make it 42 inches long. Take one piece, and fold it in half lengthwise, with the fold on the right. 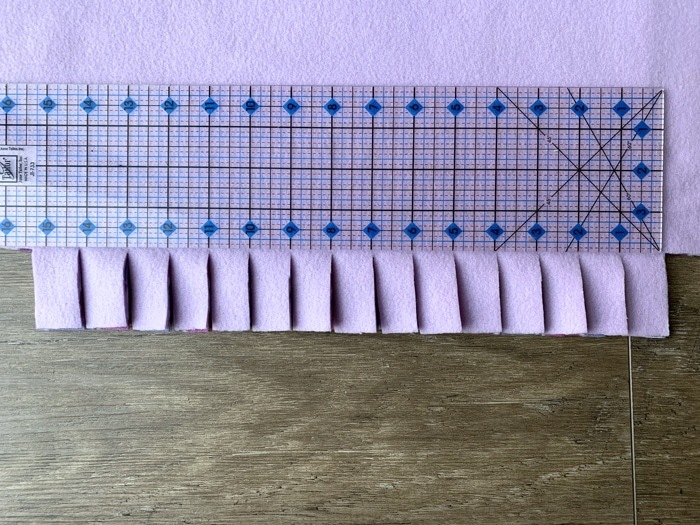 On the top edge, measure 12 inches from the fold and make a snip on the top to mark your spot. 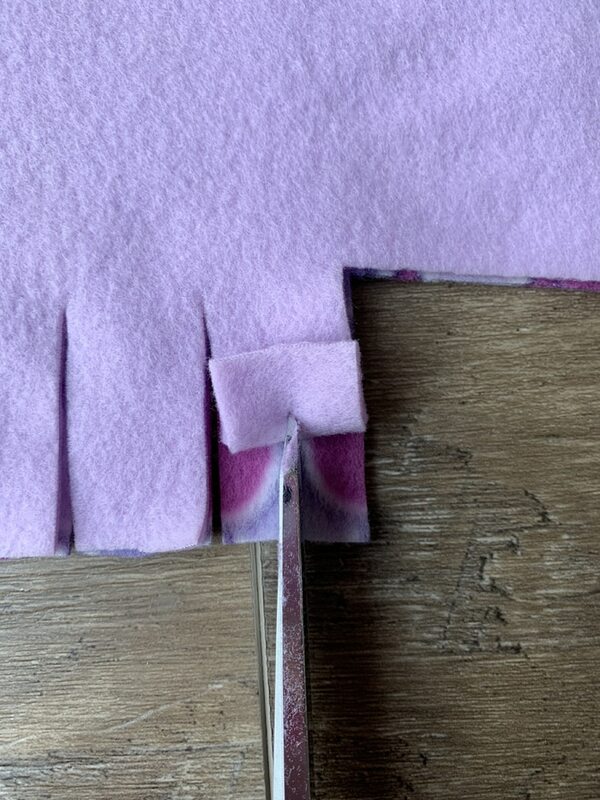 On the bottom edge, measure 9.5 inches from the fold and make a snip on the bottom to mark your spot. Take some masking tape, and run a straight, diagonal line from one snip to the other. Cut along the tape line. 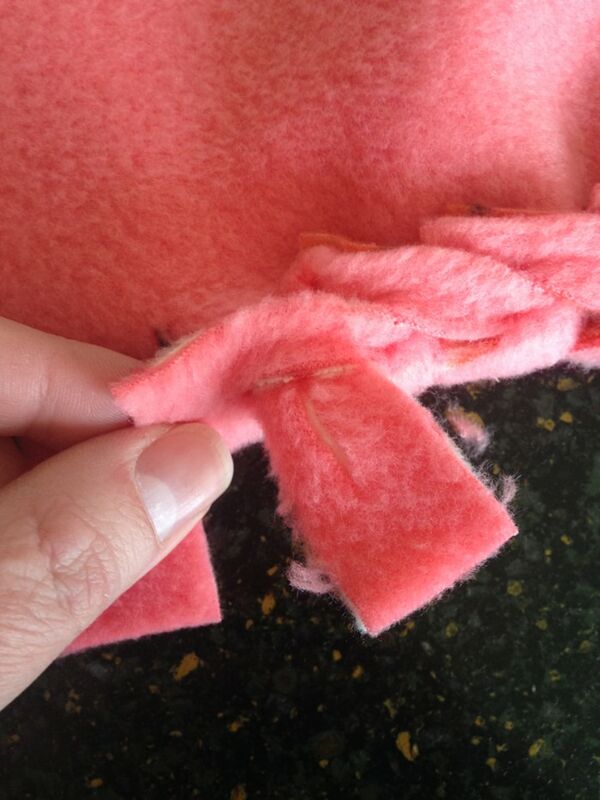 Take your second piece of patterned felt and fold it in half. Place the previously cut piece on top (still folded), and use it as a guide to cut the second piece. You should be left with two pieces that are the same size. 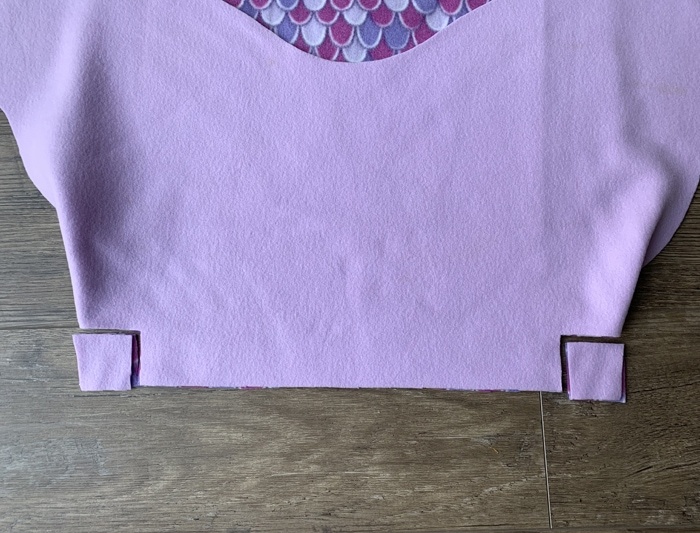 Use the pattern provided to cut two fin pieces. 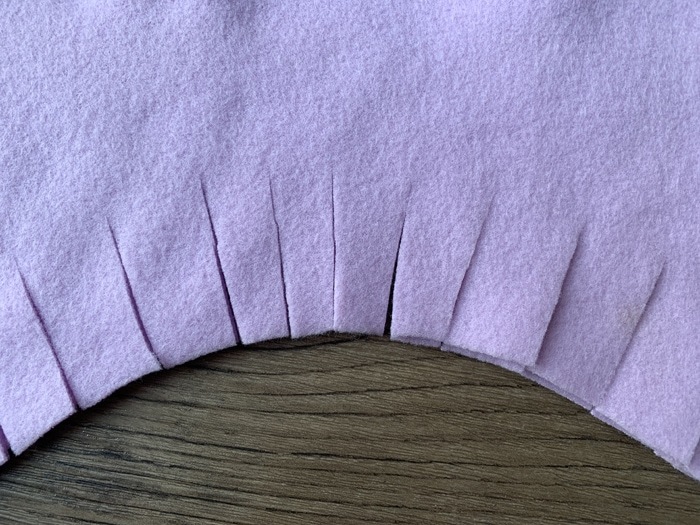 Make sure you cut the fin pieces on a fold. 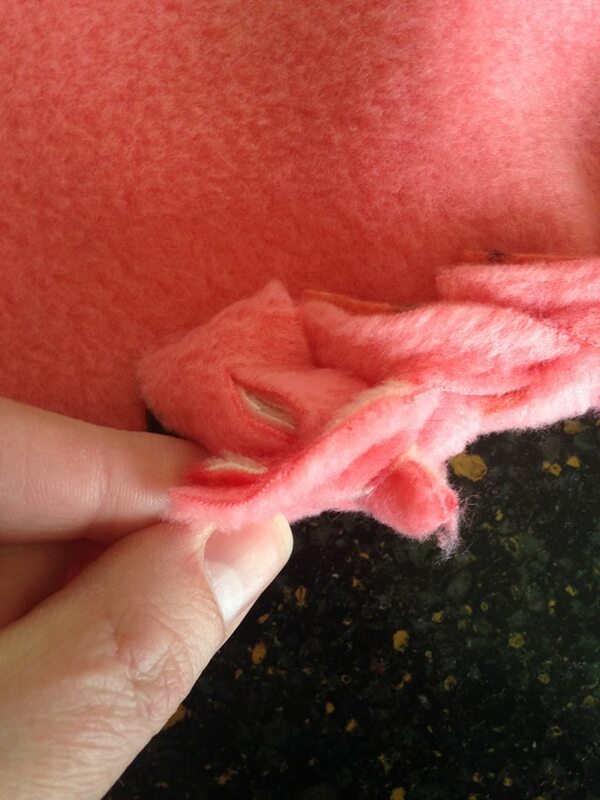 To get both pieces out of 1/2 yard of fabric, you’ll need to fold it opposite of the way it came off the bolt. 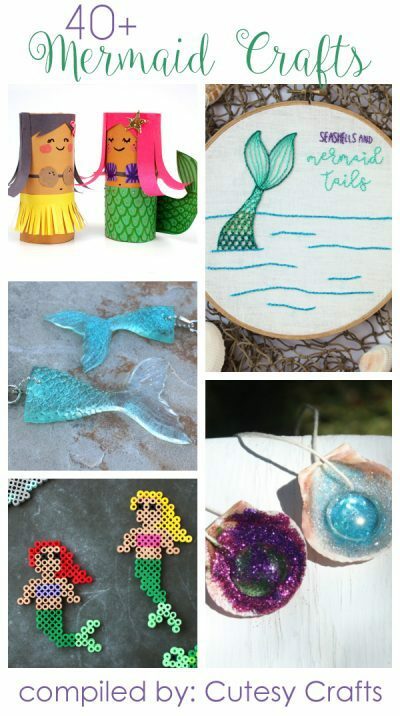 Here’s a little diagram to show you what you should have cut out for your fleece mermaid tail blanket. Place the tail and fin, wrong sides together (uglier sides on the inside, facing each other). Cut a 2×2 inch square out of the two corners. I modified the pattern, so yours will look a little different. Your edges will line up better, that’s why mine are folded under in this photo. Don’t fold yours. You will be cutting through two layers. 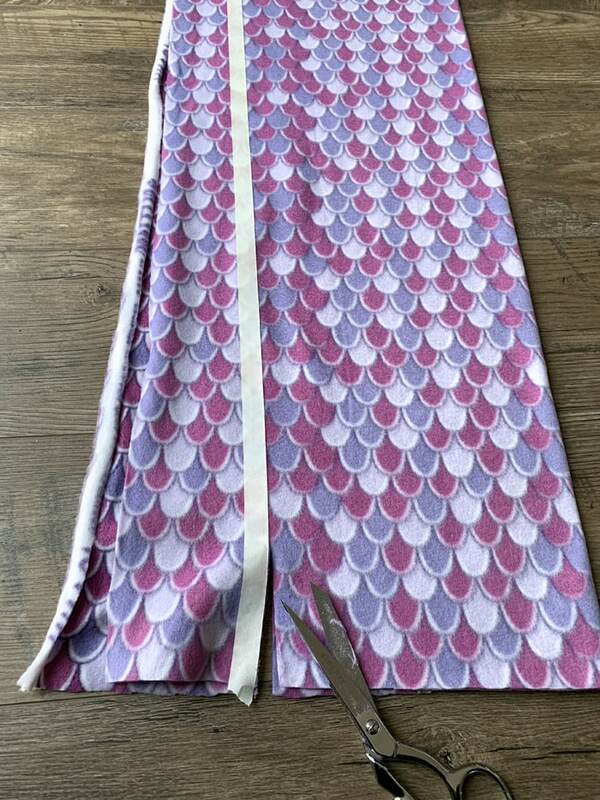 Cut 2 inch long strips, every one inch, along the fabric in the middle. Again, you will be cutting through two layers. 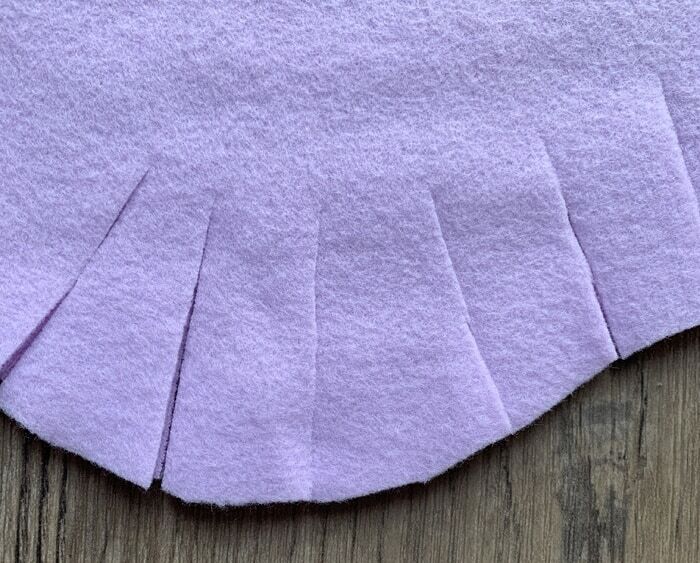 Fold each fringe piece up about 2/3rds of the way up and cut a slit on the fold. 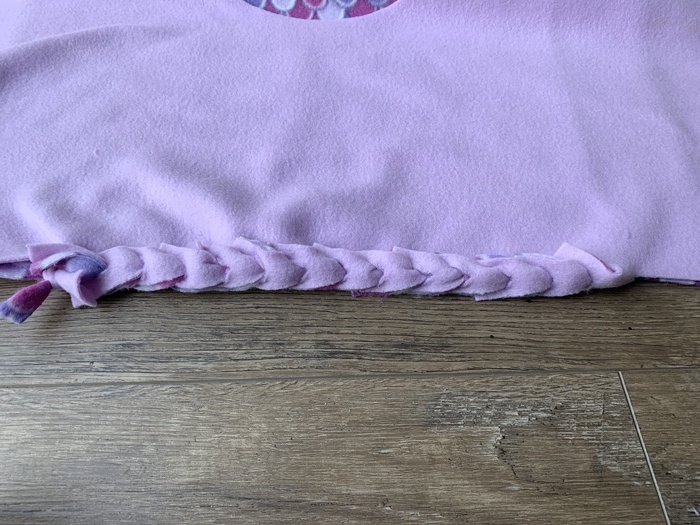 If you watch my no-sew blanket video, I fold the fringe in half, but cutting closer to the end of the fringe will give the blanket a neater look. Do not cut a slit in the last fringe piece on the left. Start with the tab on the right, and begin “braiding.” It’s not really braiding, more like crocheting, and it’s pretty simple once you get the hang of it. Basically you want to take the fringe piece to the left and put it through the hole on the fringe piece to the right. Pull it though, and that becomes the next hole that you use. Make sure you grab both layers of the blanket and treat them as one. 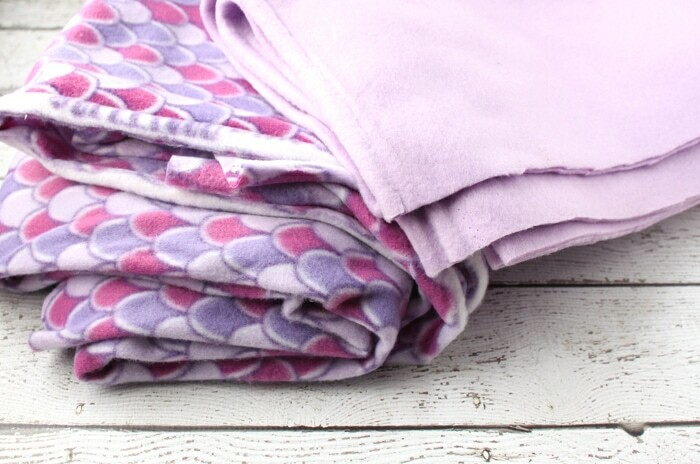 If this is confusing at all, watch the video on my no-sew fleece blanket post. When you get to the end of the row, separate the two fringe pieces left. Run one of the pieces through the previous slit, and use the other piece to tie a knot. If you watch the video linked above, I do this as the last step in making the blanket. 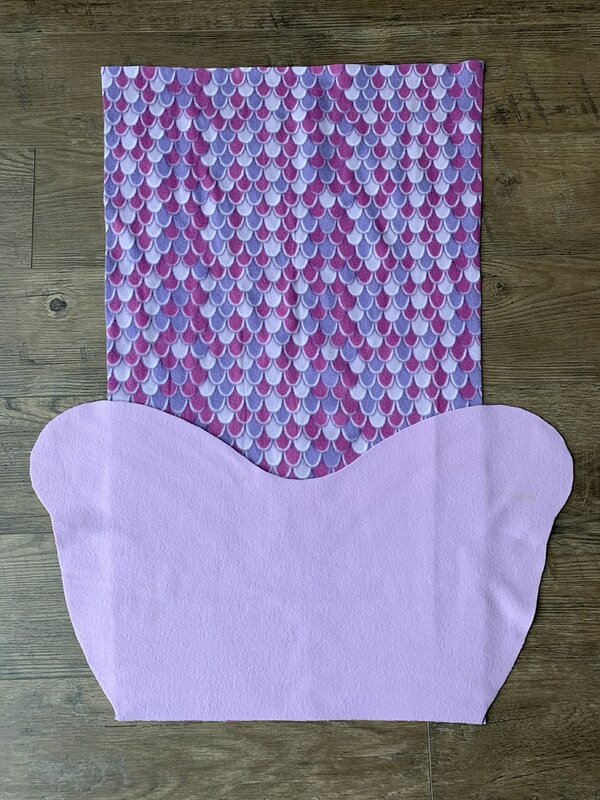 Repeat all of the previous steps for the other tail and fin pieces for your fleece mermaid tail blanket. When you get to the curvy parts of the fin, the fringe won’t be as nice and even. That’s totally okay. Cut the fringe slightly thinner on the upward curve of the fin. The two points of the fin will probably end up with fringe shaped like this. Cut some tiny wedges to fix those. Just make sure the wedges come to a small point at the top like in the photo below. Now, start at the top right of the waist and begin the “braid” again. When you get to the part where the tail and fin meet, just keep going as if it was one piece. 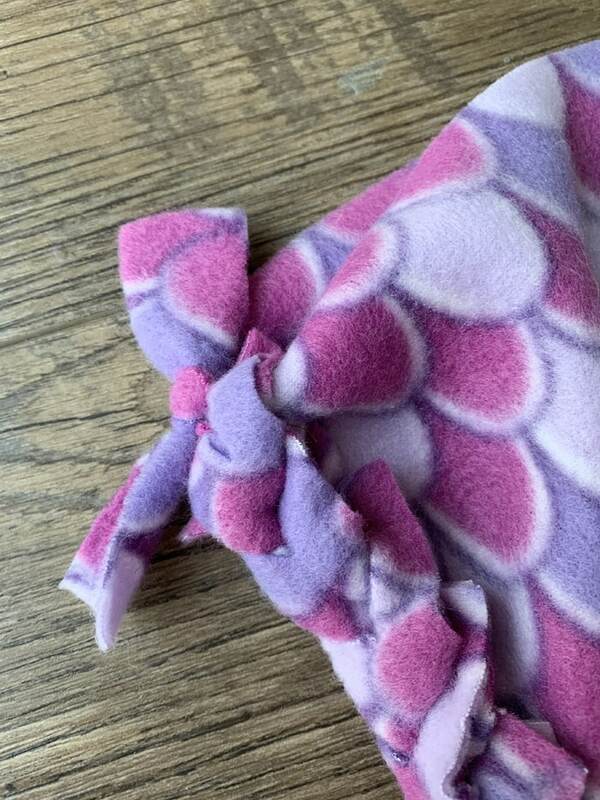 Tuck the knots inside the blanket from when you attached the two pieces together. Continue the braid all around the tail, until you get to the other side of the waist. Separate the last two fringe pieces that you hopefully didn’t cut slits in. Thread one through the previous hole, and tie a double knot with the two pieces. This knot will show, but I think it looks kinda cute on the hip of the blanket. Like a little bow! That’s it! Hopefully I was able to explain everything okay. It’s hard to convey in photos sometimes. Feel free to ask questions if anything is unclear. 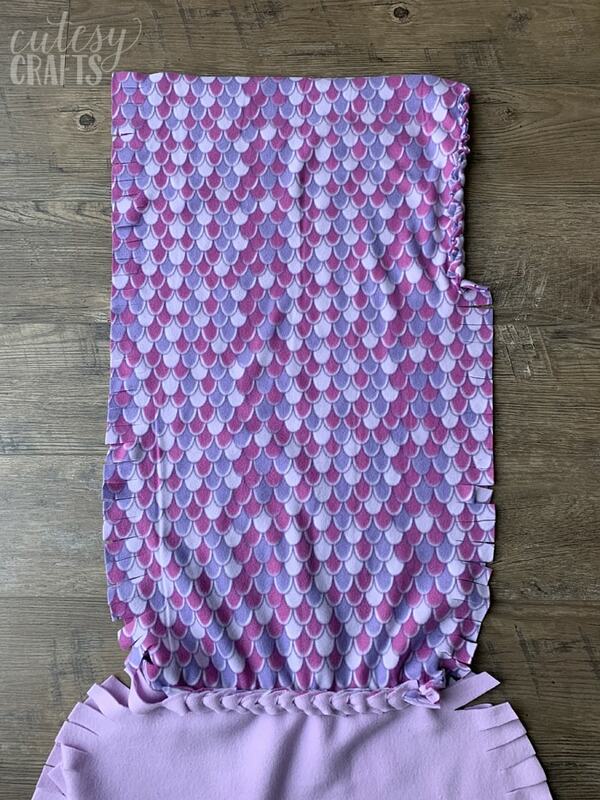 I really want you all to be able to make your own no-sew fleece mermaid tail blanket. 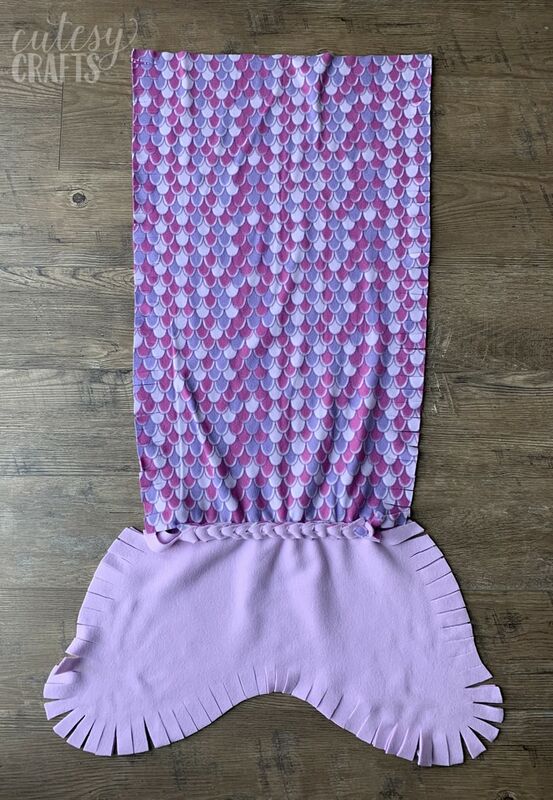 To download this free no-sew fleece mermaid tail blanket pattern, enter your information in the form below or click here to subscribe to my newsletter. 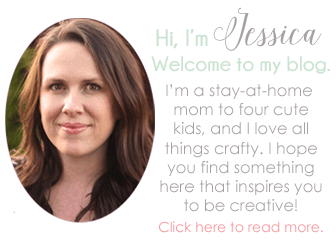 It’s free, and I’ll keep your email address safe. You can also unsubscribe at any time. 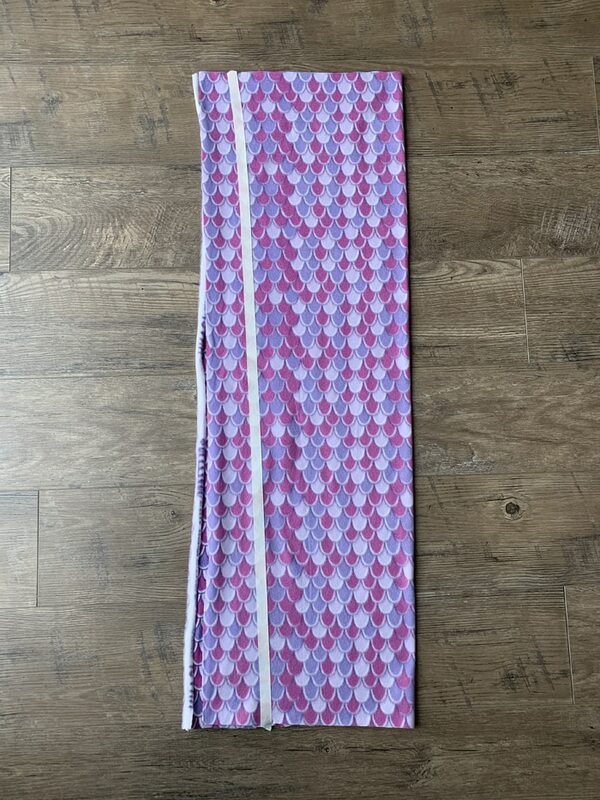 This is a very cute pattern. Having four great grand daughters I’m sure that they would like to have one, but I can’t get it down loaded. Thank you. Merry Christmas. Oh no! That’s where I got it from. 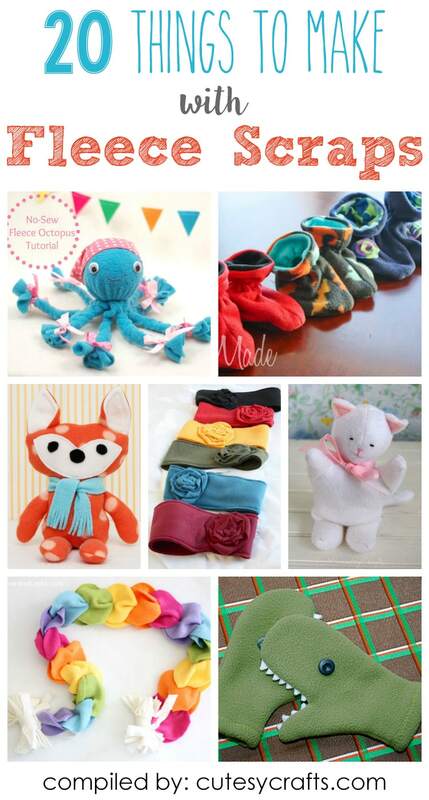 Do you have another store nearby that you can have look it up to see if they have any in stock? I think you can just give them the item number. Oh, I just saw that they tell you what’s in stock online. What a bummer!